This tutorial will review the process of restoring a full TYPO3 backup on your hosting package and configuring it properly after that. This may be required if your website gets corrupted somehow due to the latest changes being made. The first step is to restore the files of your TYPO3 backup. First, you need to decide the location, where you wish to restore the files. If you would like to access your website directly via your primary domain, this means that you need to upload your backup files to the public_html/ directory of your account. However, note that this may differ, depending on your requirements. Also, ensure that the directory where you upload your TYPO3 files is empty. There are two ways of uploading your files to the server - using an FTP client, following our FTP tutorial, or uploading directly through your cPanel account > File Manager, following our cPanel tutorial. To restore the database of your website, you first need to create a new one on your account. 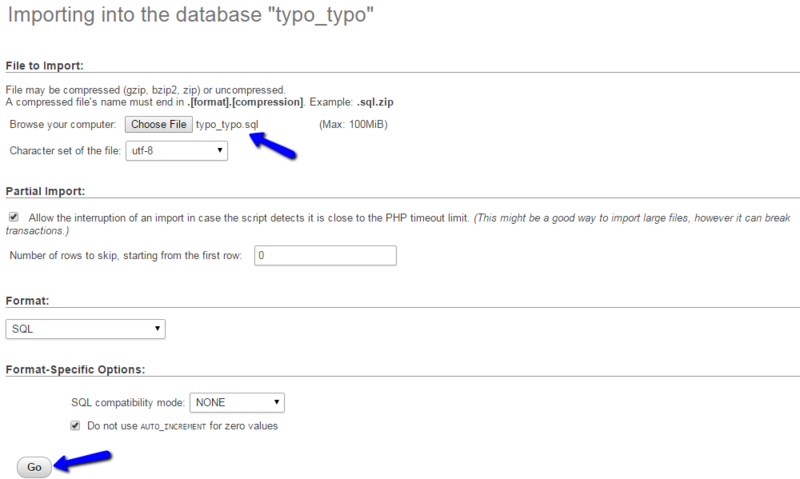 This will allow you to import the database backup of your TYPO3 website without any issues. You can create a new database and a user assigned to it via cPanel. Simply follow our MySQL Wizard tutorial for information on that. Once you create a new and empty database on your account, you can proceed further with the restore. First, access your cPanel account and locate the Databases section. Click on the phpMyAdmin service. Select the newly created database on your account from the list on the left side of the screen. Click on the Import button at the top menu. Select the dump backup copy of your database from your local computer and click on the Go button to proceed with the import. The last step of the restore is to link the files and the database together. For that purpose, you need to access the TYPO3 main configuration file for your website. From there, you need to enter the details for your new database, user and the password it is using to access the database. Save the file and you will be able to access your restored website normally.